An icefield in the Saint Elias mountain icefield ranges is seen in an undated handout photo. As the Earth warms at a faster rate than it did previously, a combination of less snow and a rapid melt is causing glaciers to recede in area and volume, Prof. Robinson said. The first “State of the Mountains” report, co-authored by the two professors and published in May by the Alpine Club of Canada, says outside of the ice sheets of Antarctica and Greenland, Canada has more glacier cover than any other country. Of the estimated 200,000 square kilometres of Canadian glaciers, one quarter is found in the West and the remainder are in the Canadian Arctic Archipelago. 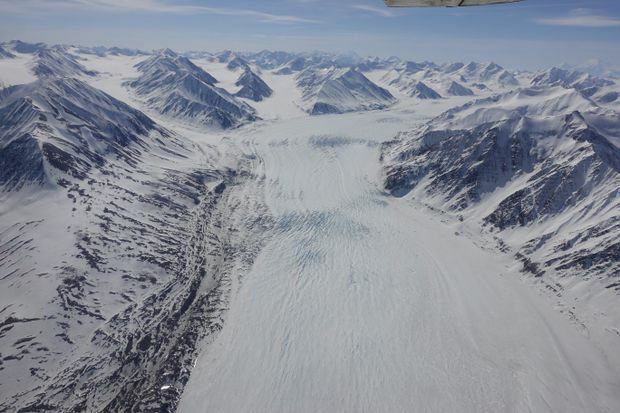 Prof. Robinson said mountain glaciers, given their sensitivity to warming, are showing the earliest and most dramatic signs of ice loss, and the St. Elias Mountains in Yukon are losing ice at the fastest rate. “Yukon glaciers in the St. Elias ranges have lost approximately one-quarter of ice cover since the 1950s,” he said. Scientists studied the glaciers using a number of methods, including analyzing old photographs and remote sensing. One of the first effects of melting glaciers is an increase in sea level, Prof. Hik said. Melting of the St. Elias glaciers accounted for a 1.1-millimetre increase in sea level rise in the past 50 years, Prof. Hik said. While the melt increases water levels and sets off coastal erosion and flooding, it also causes dry areas and dust bowls. As glaciers recede, more water flows downhill, but the further the ice sheets retreat, the less water there is to go down stream and soon the area begins to dry, Prof. Hik said. “In places like the Kluane River in Yukon, there is significantly more dust because the valley that the river flows through is essentially dried out,” he said. But the area still experiences katabatic winds – winds coming off the glacier – which are quite strong and blow the dust from the dried stream beds farther out on the landscape, Prof. Hik said. Glaciers act as a bank account during hot summers when water is scarce, he added. “In some places you’ll have locally increased water availability and in many, many, many places that water availability will be reduced as well,” Prof. Hik said. The changes alter the flora of the area. Tree lines are moving up the slope, and willows and birches – water-loving species – are prospering at higher elevations, Prof. Hik said. Prof. Robinson said it’s important to study mountains because they respond rapidly and intensely to climate changes and are recognized as sentinels of change.